I hope this works. I am completely new to working with eurorack. Previous to starting this adventure, I have used a Korg MS-20, Moog Mother 32, DFAM, and Moog Grandmother. 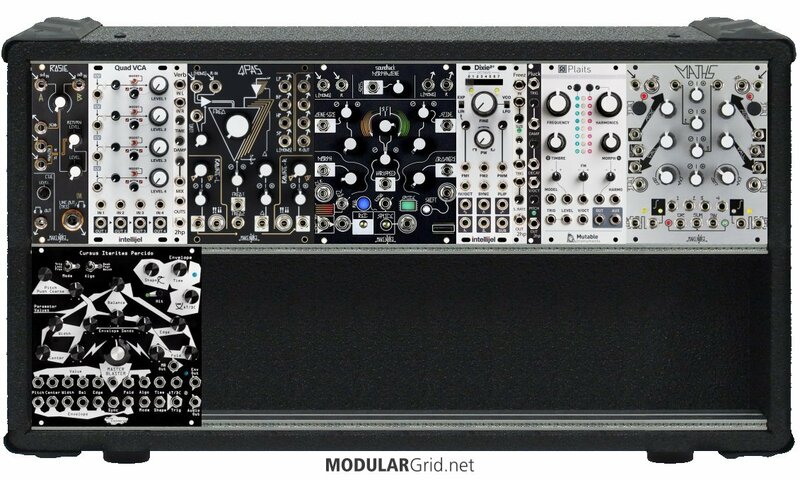 What should my next module be? I received these module units (in the link) in the last 2 weeks and hope to sit down with them this week and experiment. Looking to add a couple more and then really sit down and just try everything imaginable. Look forward to hearing suggestions. I think this looks like a great start, and you don't need much more to get going. One suggestion would be to find a way to generate CVs for notes and triggers. For example, with an FH-2 from Expert Sleepers, you can connect a USB midi keyboard to trigger and play different notes on the Plaits. Without a keyboard, there are a couple of other options. You could add a small sequencer (e.g., SEEK from Copper Traces). You could add a bigger sequencer (e.g., Rene2) but then you would also need a clock (e.g., Pamela's New Workout), and then you are well on your way down the rabbit hole. You could add a quantizer, and let the Maths drive the tones. Or, you could add a random generator (e.g., Marbles from Mutable Instruments) for triggers and notes. Other than that, I can recommend a Disting Mk IV. It is the Swiss army knife of modules. It can be a quantizer, random generator, sample player, recorder, envelope generator, LFO, VCO, or fifty other things, all by itself. It is great for learning what module you need next. E.g, if you always end up using it as an LFO, then you need a dedicated LFO. Thanks. I think I'm going to order the Cooper Traces unit, although it looks like there will be a short delay ordering from Perfect Circuit. What do you think about using the sequencer from the Moog Mother 32 in the meantime? It also looks I could possibly use the Gate Out of the Grandmother into a CV input on the Plaits. Let me know what you think about this short term solution. Ah - I didn't realize that you still had the Mother 32. In that case, it should be perfectly fine to use the "KB Output" and "Gate Output" from the Mother (note though, that the Mother outputs -5V to 5V for V/oct, and I believe that the Plaits need positive V, so you may need to go up five octaves on the Mother to get positive V/oct ... or you can use Maths to add offset). But to get started, I really don't think that you need anything else at the moment (if anything, the Disting). I would start thinking about effects. A nice reverb, a nice delay, maybe something like a Rain Maker or a Monsoon (expanded version of Mutable Instruments Clouds). As far as synth modules, an Expert Sleepers Disting Mk4 is a cheap (under $200) add and has plenty of functions. An Ornaments & Crime module would serve you well as well. Take it slow and really get to know your new stuff. Try to squeeze as much creatively out of what you have as possible... then get a feeling of where you'd like to explore. Modules like O_C and Disting are multifunctional. If you're using a particular function a lot, you might consider a dedicated module for that purpose... for example if you're using the quantizer a lot. Don't be afraid to make a wild, one-off purchase every now and then too... sometimes something weird shakes things up a bit. Mosorensen - Do you know if patching out with the Grandmother would create a similar issue as you described above? I should also mention that I also have a Make Noise O-Coast and Digitakt. I've had a couple of musical projects going on and I can finally put this thing together tonight after work. "KB OUT RANGE - The voltage range of Grandmother’s KB OUT (pitch CV) jack can be either -5 to +5 Volts, or 0 to 10 Volts. To adjust the KB OUT Range setting, press the (C#2) key, and then use the first two white keys to select -5V to +5V (F0), or 0V to 10V (G0). The Default is -5V to +5V." So it looks like you can set the KB OUT to the 0-10V range, which works better with Plaits. You are the master! Thanks. I'm glad I found out about this page. Your help is much appreciated. Hi again - I spent some time with my Plaits, and as long as you adjust the coarse tuning, it actually works well with pretty much any voltage range that you throw at it, so positive or negative voltages, no problem. Nice start, indeed. Effects are a good suggestion. You’ll have to decide whether you want to use them as a utility or part of sound design, which will dictate the extent of CV control you’ll want. Suggest you look at Chronoblob 2, Magneto, 4ms Dual Looping Delay, ErbeVerb, Black Hole DSP2, as well as 2hp delay and reverb. Now, especially for the Morphagene, a CV sequencer would come in hand. I really like the Malekko Voltage Block. A multi mode filter is also a fairly basic need. Erica Black VCF 2 is nice, and so is the Morgasmatron. For everything MI, always consider the micro versions (e.g. Beehive vs Plaits). And: Intellijel 7U case with the Audio I/O is always a great choice. You do need audio I/O, eventually.